Welcome to articles of sword's page ! 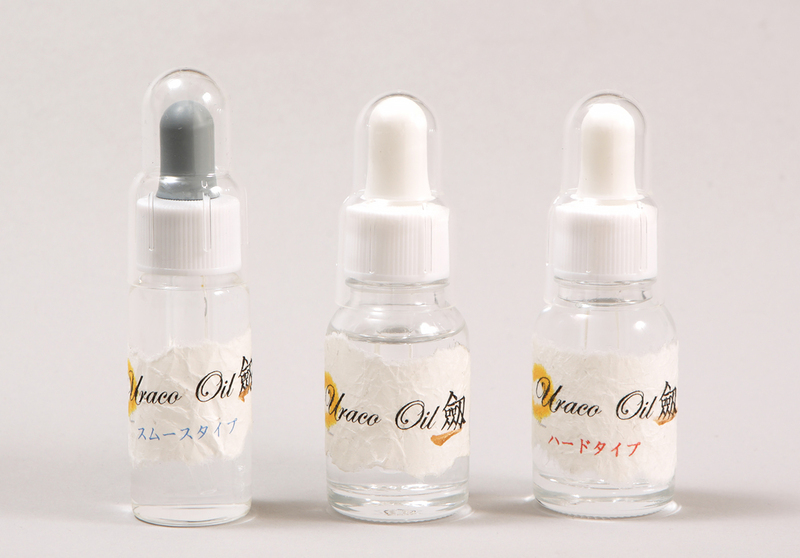 [ Feature ] Sword oil made by Urako company named "劔 (sword)" has three types ; smooth, regular and hard. It is possible to use properly according to the preference and feeling of use. It is easy to use container of eyedropper type. Smooth type has high fluidity and it is effective for removing such as removal of old oil stuck to the blade and blade sculpture. However, the rust preventive effect is lower than the following regular and hard types. Regular type is polymer oil as well. It is excellent in stability over time. 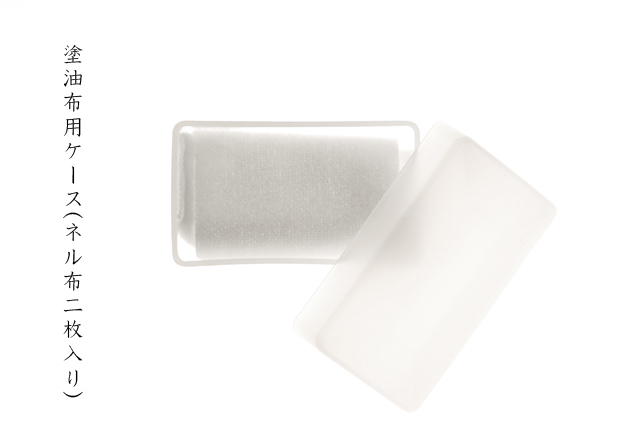 It has high antirust effect and features easy to wipe off. Hard type has high viscosity. A firm oil film can be maintained for a long time. Therefore, it is recommended, for example, if the interval of the swords care is long. 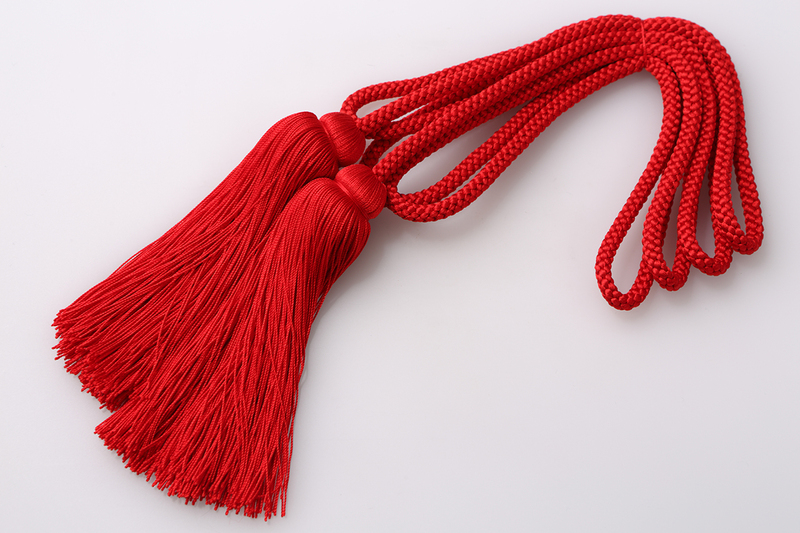 [ Feature ] Tassel, made of pure silk in scarlet colour. It fits on sword bag which cover tantô or wakizashi. 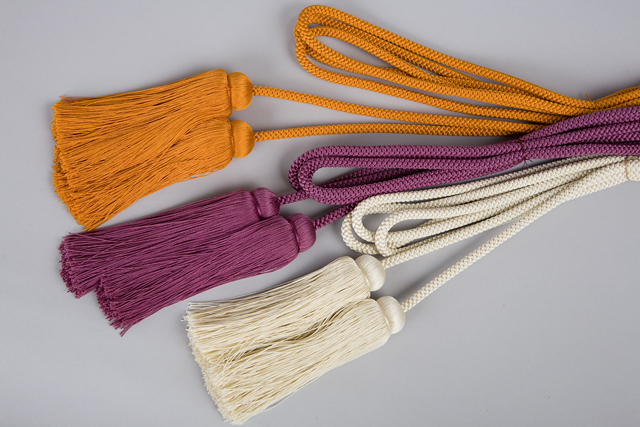 This tassel's scarlet coulour is suitable for the celebrative occasions. You can enjoy it as ornamental knot. [ Feature ] Calm ebony color enhance the beauty of tsuba. 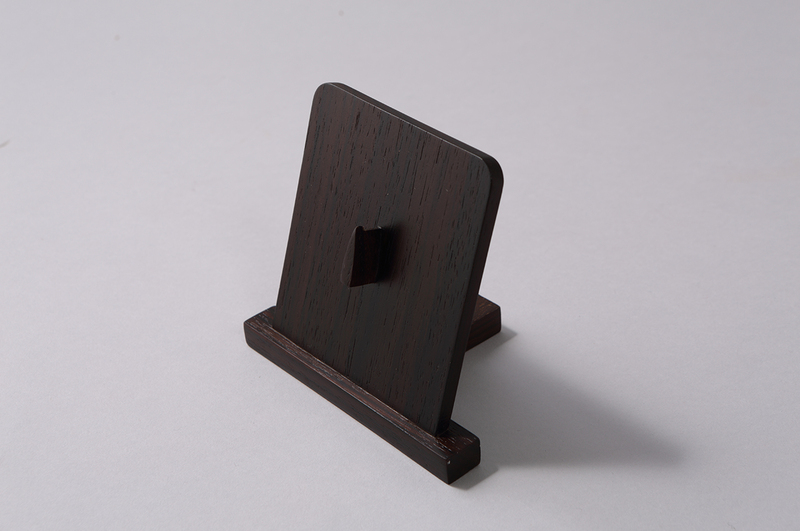 Fine finish tsuba holder. [ Size ] Made to order. Please advice, such as length, maximum diameter and required quantity. 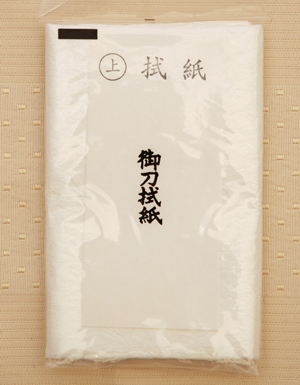 [ Feature ] Mekugi, made of susu-take, naturally fumigated bamboo around during 100 - 200 years in old personal residences, especially farmers houses with fireplace. 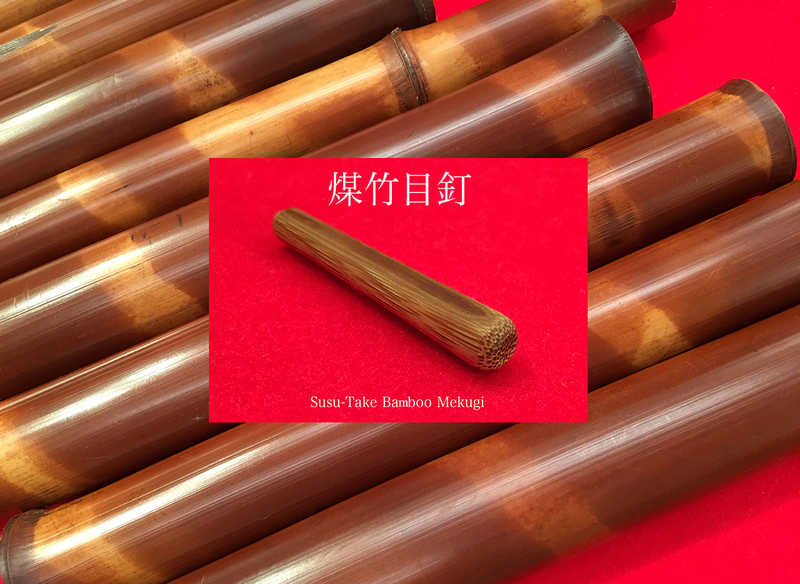 Bamboo materials which had been smoked by generated soot of fireplace were suitable for Japanese sword mekugi, since they were so solid and flexible. The parts which had tied by ropes showed pale color, which had not, showed deep color. It is a feature that the changes caused by different shades of color make charming scenery on the surface of bamboo. 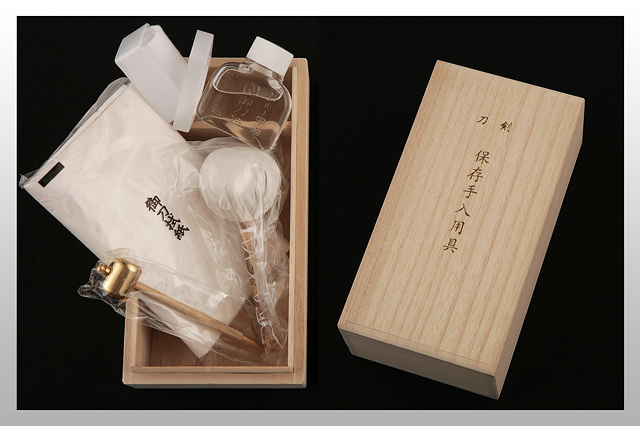 Using this beauty, there are hand crafted made items such as flower vase or chopsticks, etc. In recent years, the number of old farmers houses decreased so that it became difficult to earn such naturally fumigated bamboos from the market. 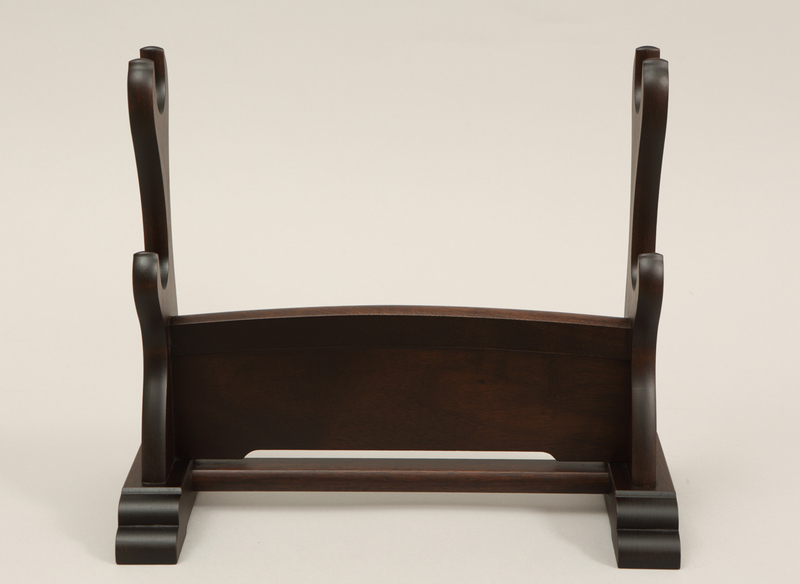 The number is limited but we can accept make to order demand from just one piece. Please refer attached image as semi-processed articles to be delivered. You can do the final finish as you like using the tool, such as file. 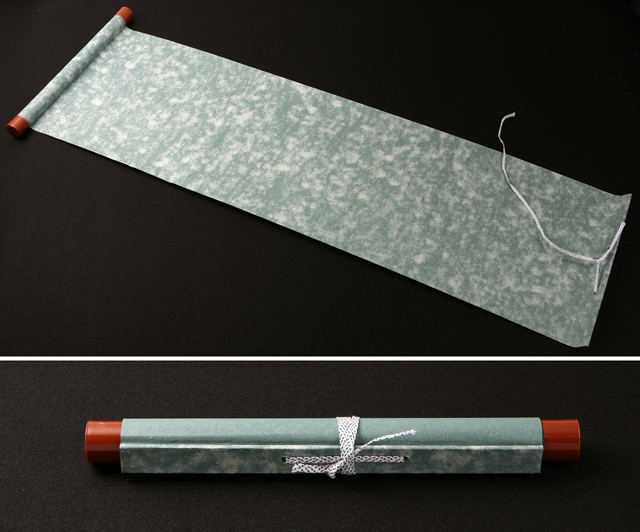 [Feature] Mekugi-Nuki, Okatana- Nugui-Kami paper, Flannel cloth, Stop rusting the highest class Choji oil for sword, Uchiko sword powder. In Kiri box. 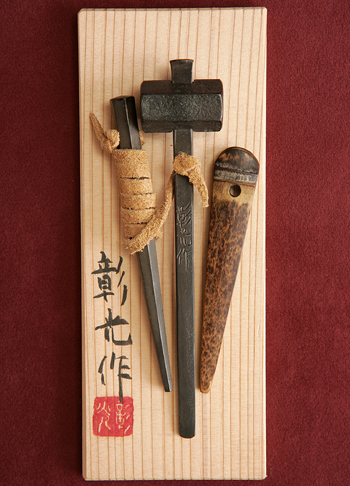 It is a set of necessary tools for the maintenance of swords. Kiri box keeps humidity appropriate, prevents garbage and dust, and defends tools cleanly. [Feature] Pure silk chirimen Fukusa in violet：One of must item for the appreciaion of Japanese swords. 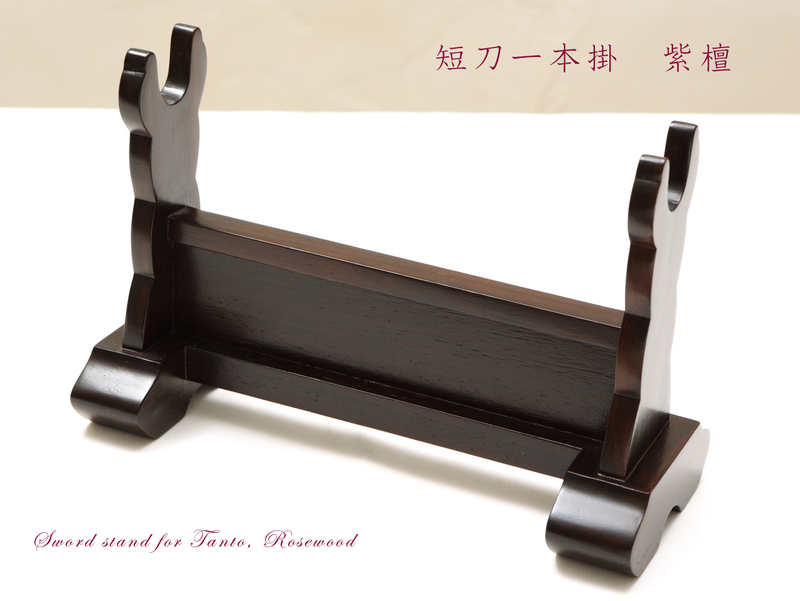 High quality, fabriced for convinience of appreciation. There is a one point accent "Uchidé no Kozuchi", which aide for distincition of tront and back. Don't miss it for sword appreciation. Current model has not "kozuchi" mark on the surface. [Feature] When you pull out nakago from tight tsuka, this Ategi is very useful. 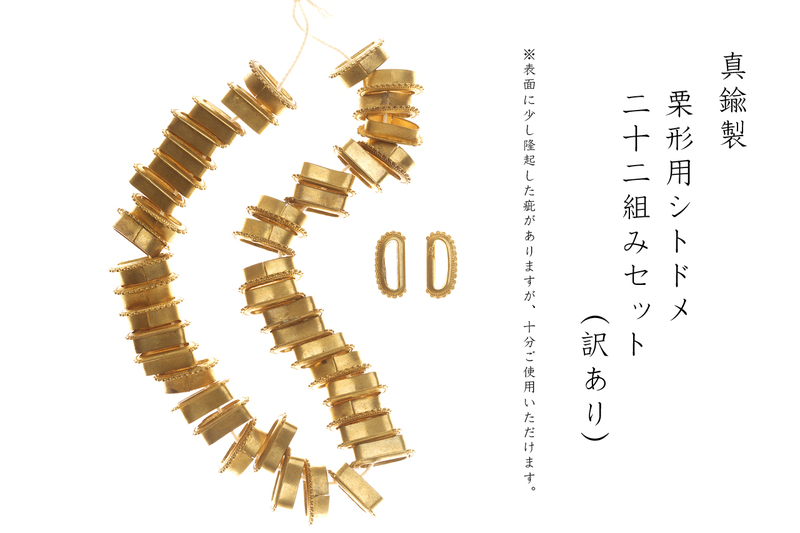 [ Features] Solid mekugi-nuki made of brass. 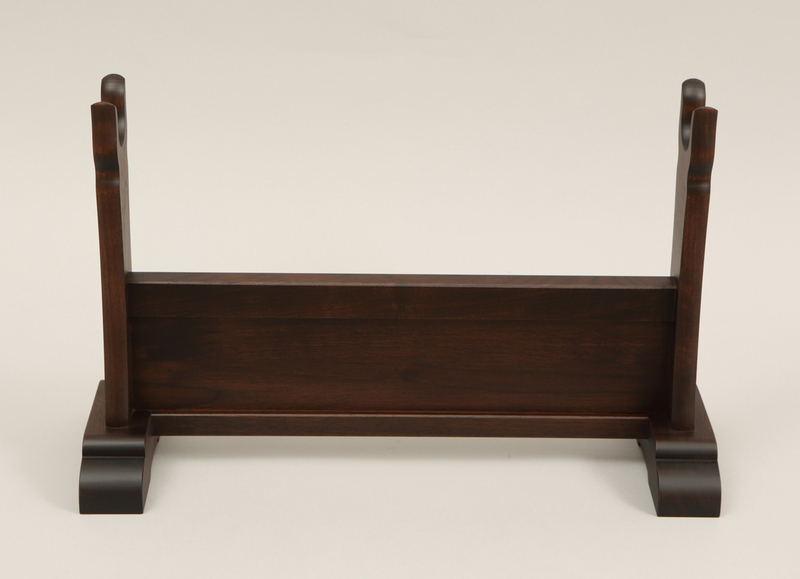 There are notches on the holding portion so that it prevents from slippage, improving practicability. Small projection portion above kozuchi can be removed by screwing. 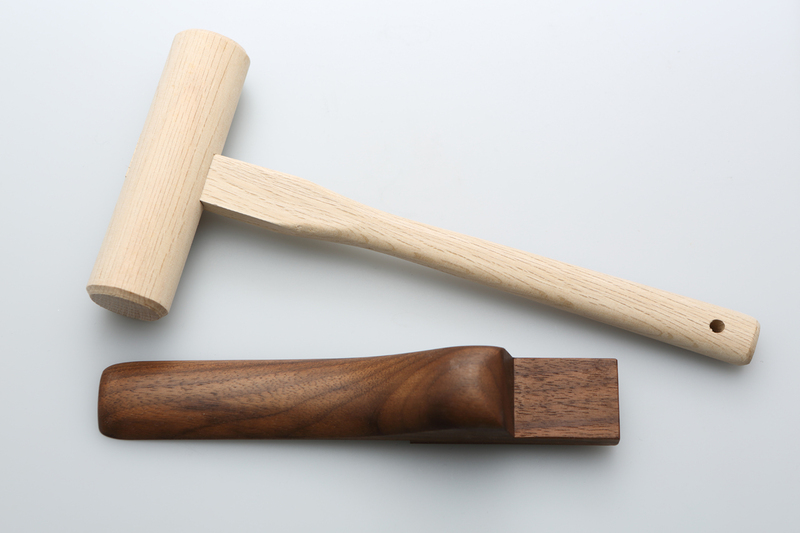 The mekugi can be removed easily, put it at top of mekugi and hit by kozuchi(small hammer). You can use the tip of handle, pushing out the mekugi. Must have for sword maintenance and appreciating. [ Feature] You can not maitain sword properly without the high quality oil. It is clear with seldom smells. Evenly distributed and spread on the surface of sword, easy to swipe when cleaning. 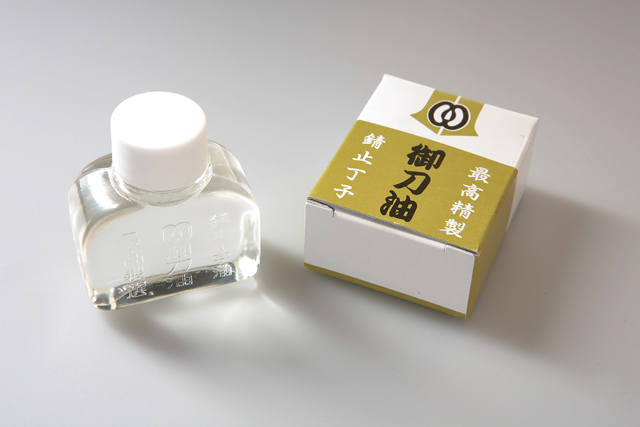 [Feature] This is Choji oil in the bottle of 20cc, it isnecessary for the maintenance of the Japanese sword. The smell of Choji is fine, with moderate stickiness, the oil protect the sword. [ Feature ] Thick, tough and soft excellent cotton flannel. You can use it without any water process. Polishing tsuba or sword equipment, oil expanding for sword. Machine wash available. Please cut them in case that you extend the oil for sword. 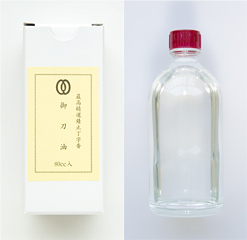 ＊At the moment of order, please specify requested size, such as C010611- L.
[ Feature ] A plastic vessel with lid. It can be used storing oild spreading flannel. Two pieces of flannels are contained. [ Feature] High quality pure mulberry papers for sword maintenance. 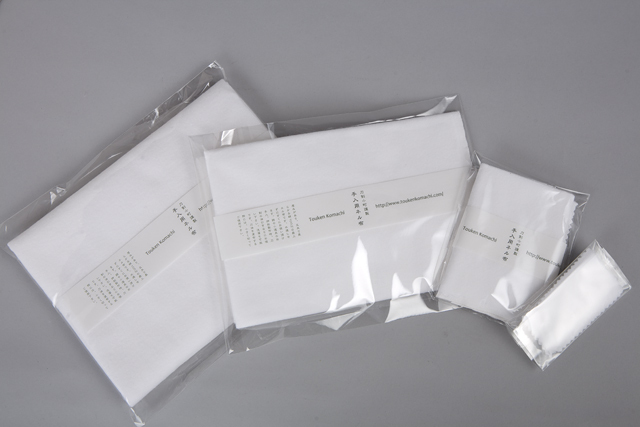 "Becchin" cloth, made of cotton 100%, which is soft and delicate. 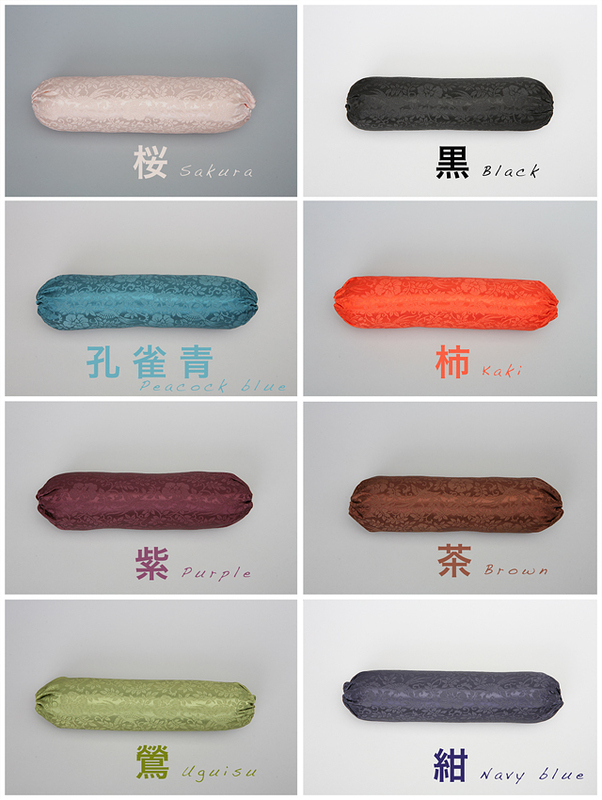 The cloth is suitable for polishing tsuba. Cloth edge is finished with lockstitch machine. 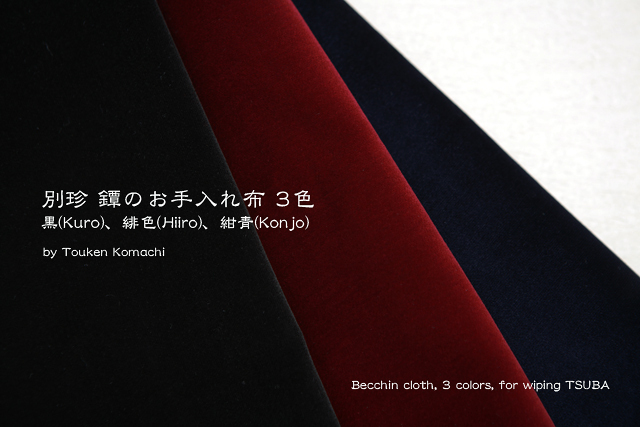 Color code : 1 for Kuro, 2 for Hiiro and 3 for Konjo. Please advice us color code when you make order. 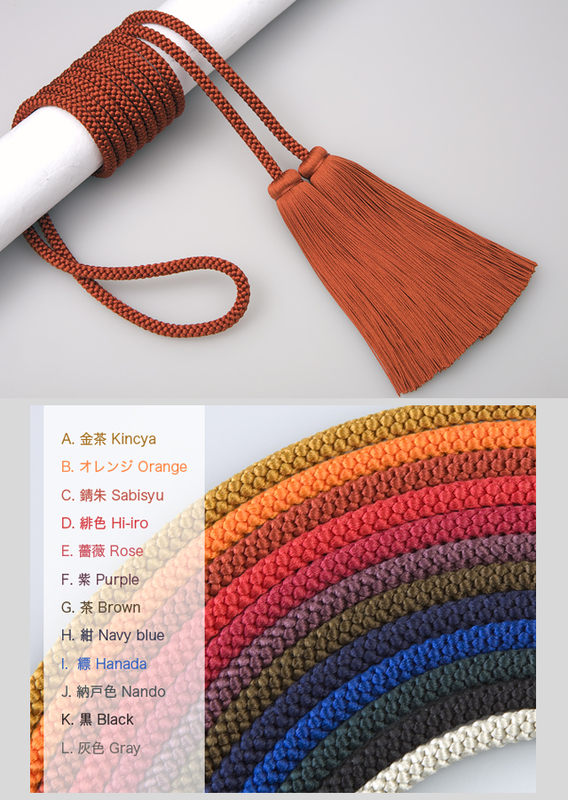 You can choose your perferable tsuka-ito (covering fibre of tsuka) from several colors, made in excellent pure silk tune-kumi-himo. 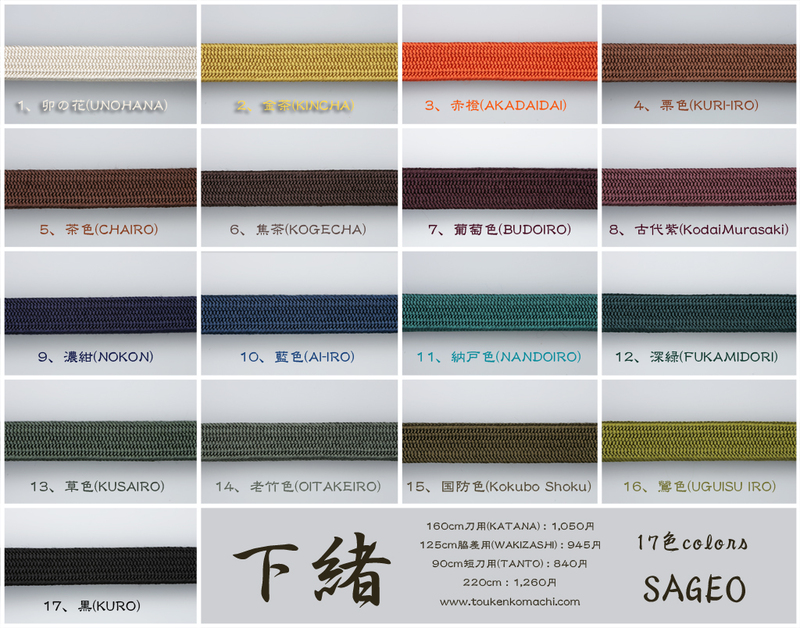 You can choose patterned sageos, such as a) Garaori Midori, b) Garaori Kon. Please advice us ; 1) color number 2) length at the moment of order. Rayon. Also pure silk available. Please advice us 1) color number 2) size. You can ask us special color other than above. Please advice us 1) color number 2) size. 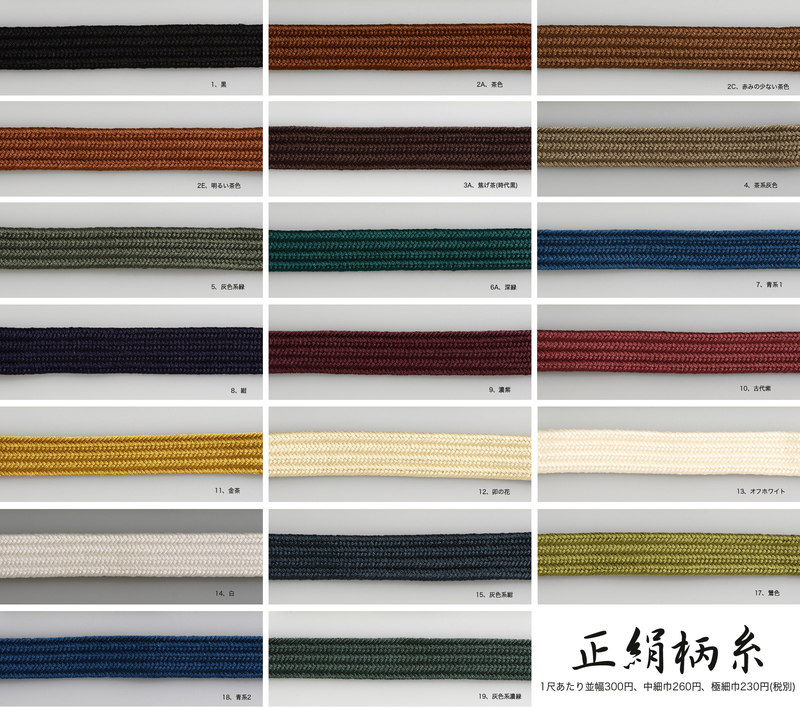 12 colors, Kincya / Orange / Sabisyu / Hi-iro / Rose / Purple / Brown / Nay blue / Hanada / Nando / Black / Gray. The material is pure silk. 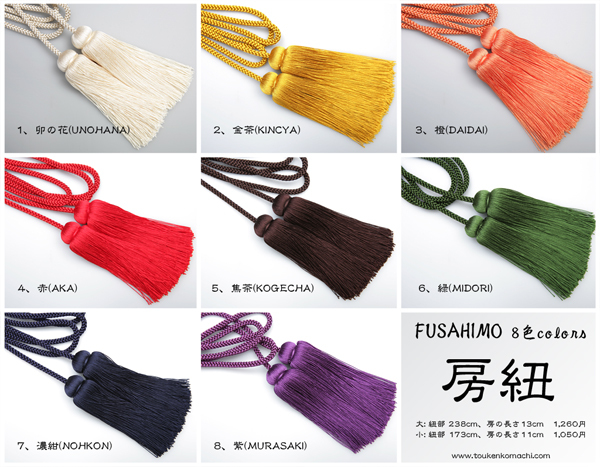 Those fusa himo are basically order made so you can make your preferable colour, lenght and volume of fusa. Other than above twelve colours, you can order gradational colour, too. Please ask us. *Time for delivery takes about one month. [Feature] Two one-touch buckle attached. You can squeeze them easily. Bag can put swords up to 140cm in the total length. Additional belt of fichu. With convenient pocket that can store maintenance tool and small articles. Very strong needlework. 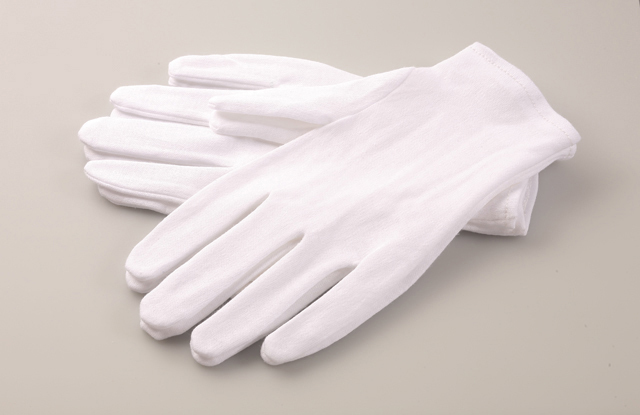 The nylon material is thick with high water-shedding quality. It is light, easy to handle and strong. You can use long durability. [ Feature ] Shitodomes for kashira made of brass. Manufactured in Showa period. 17 sets are in stock. There is a flaw which occured during manufactuirng process but no hurm for practial use. 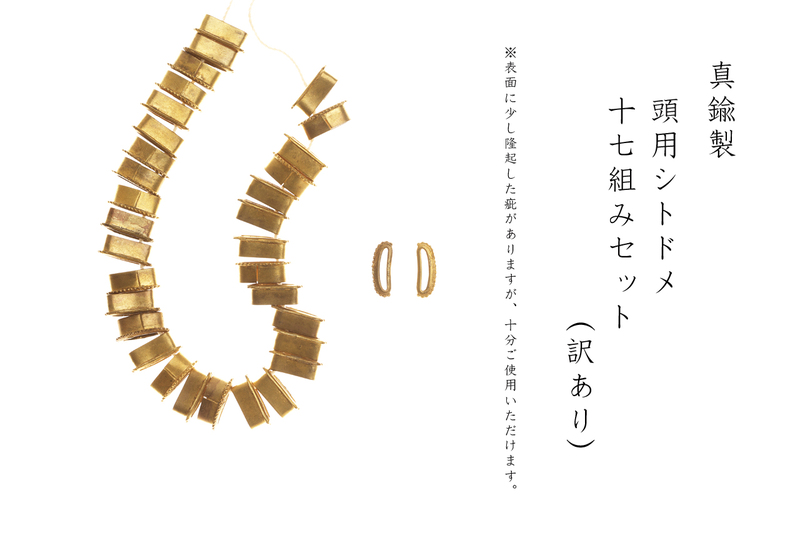 [ Feature ] Shitodomes for kurigata made of brass. Manufactured in Showa period. 22 sets are in stock. There is a flaw which occured during manufactuirng process but no hurm for practial use. [ Feature ] Shitodomes for kashira made of brass. Manufactured in Showa period. 44 sets are in stock. 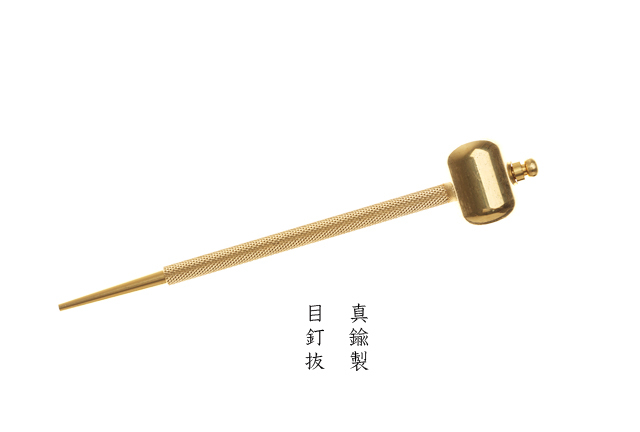 [ Feature ] Shitodomes for kurigata made of brass. Manufactured in Showa period. [Feature] Cotton 100%, It is pissible to wash. Please use it when swords are maintained and you appreciate swords and the sword fittings. [ Feature : With unified pressure provided by treble structure, repulsion is improved by rich inner cotton. When sword is put, the pillow does not collapse easily. Outer material is very soft and glossy polyester. It is hard to discolor and get dirt. We prepare eight colors. [Feature] Yokoi Akimitsu swordsmith is a famous modern Japanese swordsmith, he lives in Okayama pref. 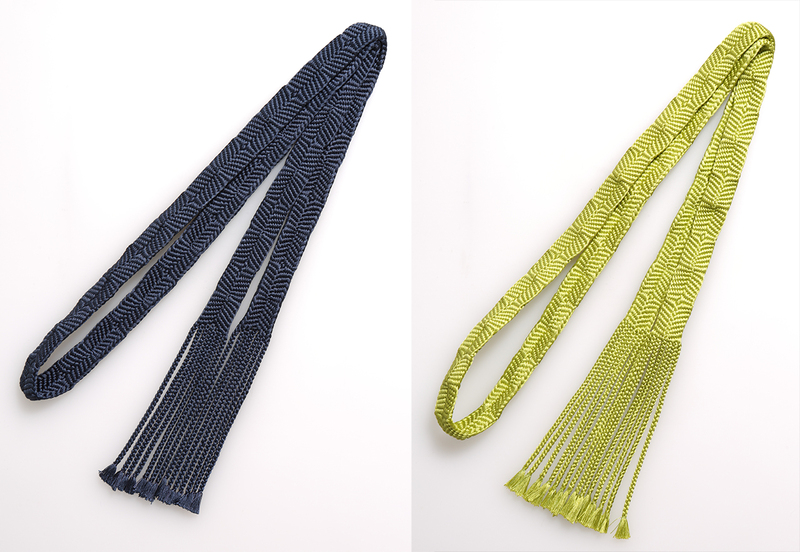 Iron Mekuginuki and Kozuchi that are tied with Suede strings.This is very precious work which made by swordsmith. Handy nice bamboo Mekuginuki is also attached. 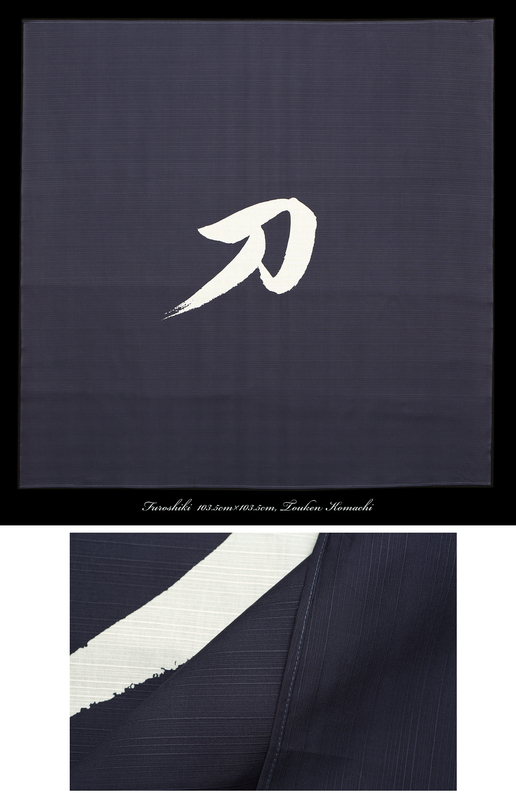 [ Size ] 103.5cm × 103.5cm, "mihaba"
[ Feature ] Cotton 100%, shantung cloth. Texture such as the pongee. Thick. 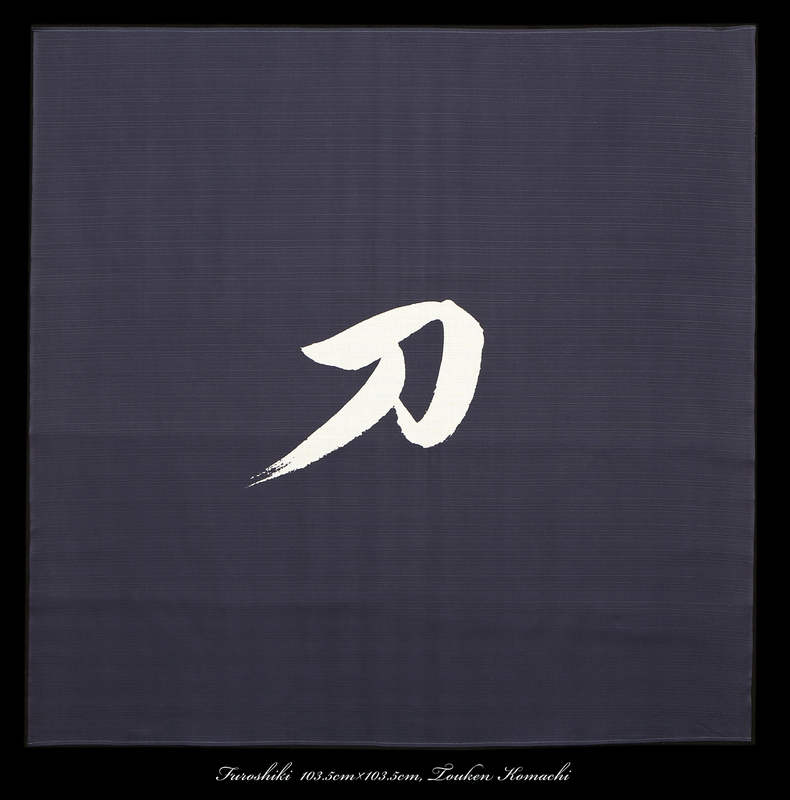 It is a durable furoshiki (wrapping cloth). Also washing available. Made in Japan. The color is Chitose-cha. [Feature] The powder is used for swiping out old oil which sticked to the sword. Intially, clean up the oil by paper only, then, spread the powder evenly on the sword. Hold the sword, then, smach your hand, which hold the sword, by opposite hand. You can drop relatively heavy particles. Finally, you clean up the sword using the paper again. 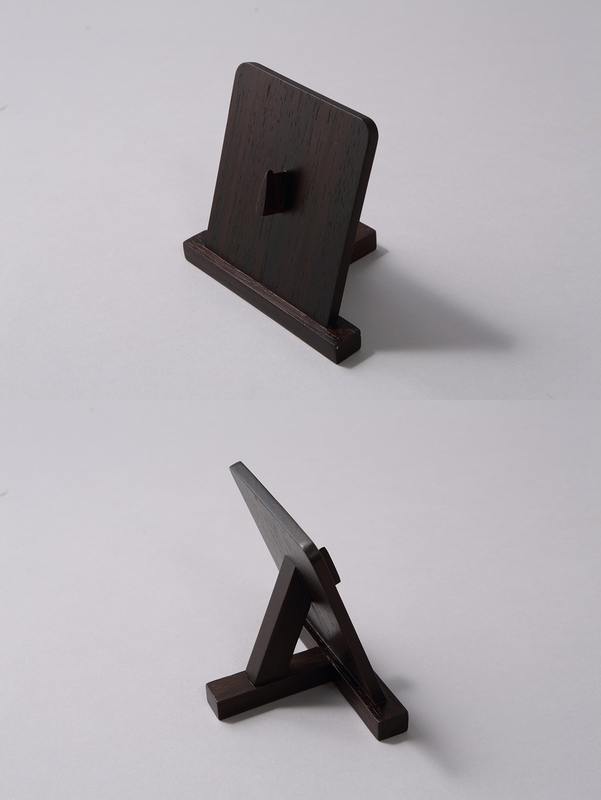 [ Feature ] Wooden stand made of walnut. Making use of grain, simple and chic design. No matter what place putting on, it is sturdy. It can hold one sword. 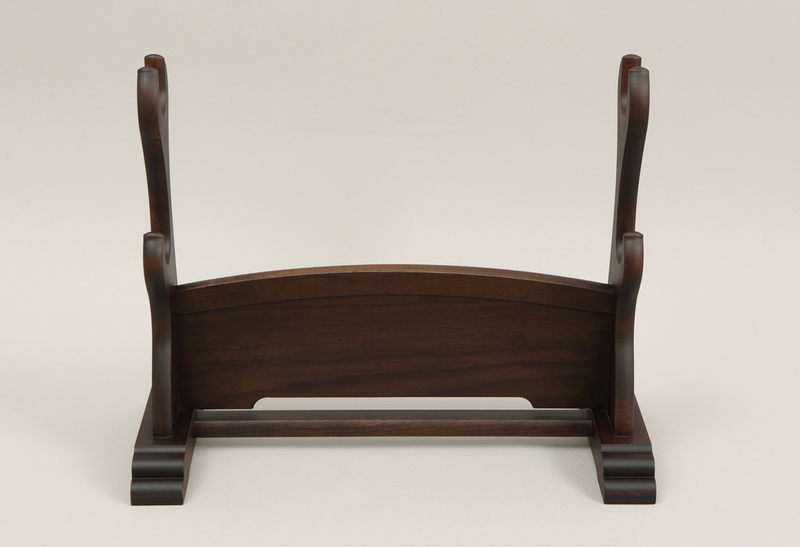 [ Feature ] Wooden stand made of walnut. Making use of grain, simple and chic design. No matter what place putting on, it is sturdy. It can hold up to two swords. [ Feature ] Wooden stand made of walnut. Making use of grain, simple and chic design. No matter what place putting on, it is sturdy. It can hold up to two tantôs. [Feature] Japanese paper, plastic. It is possible to use for preservation and the exhibition of Oshigata or Japanese picture or Calligraphy. Please order by E-mail, or by using order form.